The Indigenous People of Biafra, IPOB, has strongly condemned the continued denial of the killing of pro-Biafra agitators by the Nigerian government, military and other security agencies. However, IPOB said that their denial means that the entire defence staff of the Nigerian Army “need eye glasses to see the barbaric crimes committed by the Nigerian soldiers against the members of IPOB throughout the period of peaceful demonstrations in Biafraland”. In a statement issued by its Media and Publicity Secretary, Comrade Emma Powerful, IPOB called on world leaders to visit YouTube and watch the heinous crimes perpetrated by the Nigerian government and her security agencies against unarmed and peaceful IPOB members during rallies and demonstrations in Aba, Onitsha, Owerri, Igweocha (PH), Calaba, Uyo, Asaba, Enugu, Bayelsa and other numerous cities in Biafraland. It further stated that amidst myriads of video and pictorial evidences exposing their crimes, it is unfortunate and shameful that they could still muster courage in utter denial instead of launching a full-scale investigation into the matter, adding that they responses and reactions has further revealed the veracity of the report. The statement reads; “The Nigerian Defence Headquarters should have asked for the video coverage from the media companies both international and local media outfits in the world, after watching the videos from all corners of Biafra if they are still doubting the killings then you should understand that they are not a well organised institutions and anybody still doubting or asking questions about this crimes committed by the Nigerian army against defenceless peaceful civilians, then that person needs to be under medical care for madness. 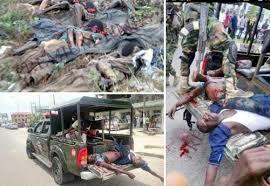 “The world now have the video evidence of the cold-blooded brutal massacre of defenceless Biafra civilians. “We want similar incontrovertible proof to substantiate the cut and paste purported refuttal by the Nigerian army spokesman. “We IPOB, suggest the defence head quarters of the Nigerian army and presidency to watch the video again before coming out to make a mockery of themselves and the entire Nigeria,” it concluded. While the Nigerian government, military and other security agencies need eye glasses to see the barbaric and brutal massacres they committed against unarmed and peaceful Biafra protesters; the so-called Ohaneze Ndigbo and other Igbo efulefu need eye glasses as well to see how their sons and daughters are being slaughtered by Hausa-Fulani in Igboland not in the North. love me then keep my comand. and they bosting for it no problem. WE DO NOT NEED TO WAIT FOR U.S.A. BEFORE WE STRIKE, PLEASE LET OUR DEAR GIVE THE COMMAND, AND IT ALSO VERY IMPORTANT FOR ALL BIAFRANS TO HAVE MILITARY TRAINING .